Lionel moved to Queenstown in 1945 to commence working at Mount Lyell Copper Mines and resided there for the next 30 years. Lionel joined the Queenstown Axemen’s club in 1952, remaining actively involved with competition and administrative duties until leaving Queenstown in 175. Also heavily involved with the Western Tasmanian Axemen’s Association. Lionel chopped mainly in the 10 and 12 inch standing events, scoring several wins resulting with a collection of cups as prizes. In 1970, in Perth, Western Australia, Lionel surprised himself by winning an event and being presented with a cup. Lionel was an enthusiastic and hard working committee member with the administration area for the Queenstown and Western Tasmanian carnivals, spending many hours assisting with the preparation and trimming of the blocks and the setting up of arenas for competition. For many years Lionel was the “Starter” for the Queenstown and Western Tasmanian events gaining an excellent reputation with his ability to organise and ensure that professionalism was maintained in the chopping arena. Lionel was enthusiastic with his pro-activeness regarding the training of younger choppers, instilling them in the need for good sportsmanship behaviour. Lionel had excellent skill regarding sharpening axes. This resulted with many Tasmanian Axemen, competing throughout Tasmania and the mainland sending their axes to Queenstown for him to sharpen and prepare. Lionel was conscientious and proud axeman, working tirelessly to ensure that Queenstown and West Coast Axemen were included in major Tasmanian events, which resulted during the “World Centenary of Competitive Chopping” held in Tasmania, 1st – 10th January 1970, with one of the carnivals being held in Queenstown on Sunday 4th January 1970, officially opened by the Hon Eric Reece, Premier and Ron Davis MHR. Lionel was President of the Queenstown Branch for many years, being presented with a “Life Membership Certificate” and badges. 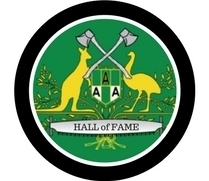 The highlight of Lionel’s career was being presented with “The Award of Merit Certificate” from the Australian Axemen’s Association. Lionel continued to follow many carnivals in Tasmania, maintaining a keen interest in the Axemen’s achievements and activities and always willing to lend a hand until his death. A Memorial Chop sponsored by Steve By Spray Paining, is held each year during the Easter Show. Compiled and submitted by his daughter, Colleen Horton, Launceston.